LAST POST 'TIL NEXT THURSDAY-- ANOTHER FRESH TOFU DISH, AND HEADING FOR VEGAWAKENING! Ken Bergeron, first chef to win a gold Medal in the Culinary Olympics with Vegetarian Cuisine. The keynote speaker will be the great Howard Lyman, "The Mad Cowboy"
I'll be reporting on my experiences when I get back. The following is a short description of a dish I did the other day, quickly using up the last of our fresh tofu. (The recipe will be in the next issue of my subscription newsletter, The Vegan Feast.) In case you missed that the other day, tofu eaten the same day it's made, or within a day or two of making, tastes lovely-- kind of like ricotta cheese--- and needs only minimal preparation and seasoning to please. Really! Trust me! 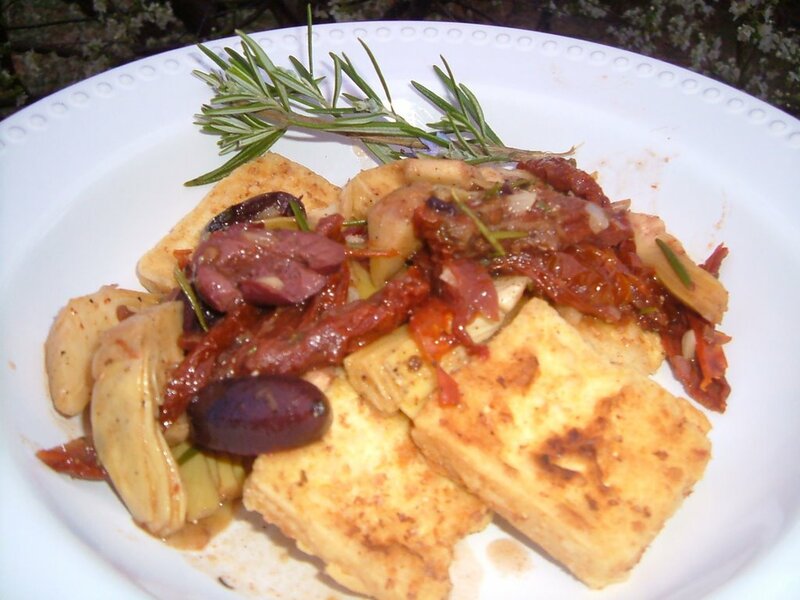 Homemade is the best, of course, but if you can find out what day(s) the bulk tofu is delivered to your health food store (and you can ask the tofu makers if it's made the day it is delivered), you can make sure to buy some and use it that day for maximum tofu delight! 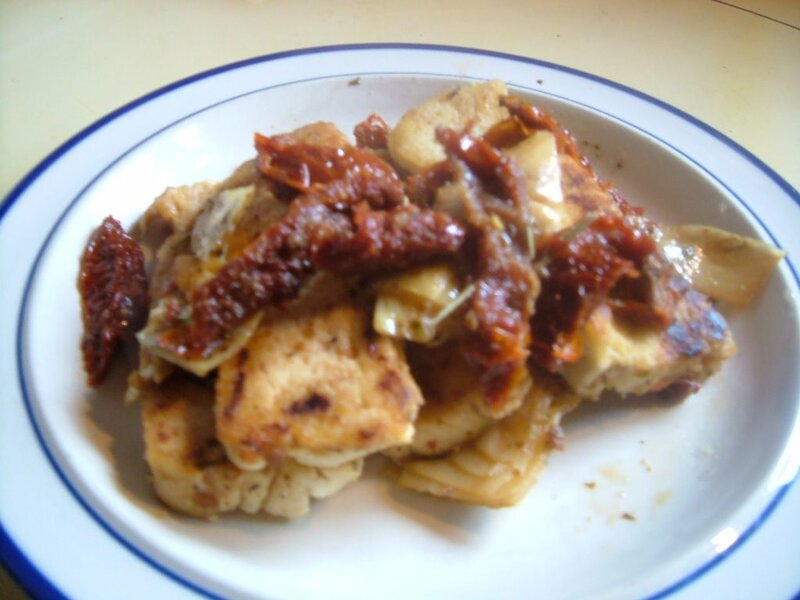 I have made this dish before, both with my own homemade tofu and fresh tofu from my health food store. This last time (photo below), I added Kalamata olives to the recipe. It's a quick dish to make and absolutely delicious. A little wine and fresh rosemary makes all the difference. NOTE: Serve this for an Indian-style brunch with Susan V's Coconut Chai Breakfast Cake for dessert! This is a vegan take-off on an Indian dish called chenna bhorji. The original dish uses the homemade cheese called chenna, which is a crumbly (unpressed) version of the more familiar paneer or panir. Absolutely fresh tofu makes a good substitute for the chenna— homemade tofu , fresh tofu from a tofu shop, or bulk tofu that has been delivered to your store on the same day that you buy it. This is important, because very fresh tofu has a taste similar to chenna. It loses flavor as it ages. This is a spicy scramble and contains no nutritional yeast, as most Western tofu scrambles do. 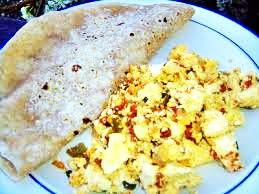 It is usually served with chapathi or flaky parathas, but a wholewheat or sprouted wheat flour tortilla makes a good accompaniment, too. Some spicy vegan masala chai would be good, too! In a medium bowl, mix the tofu gently with the dissolved turmeric and set aside. Sauté the onions in the oil in a nonstick skillet, cooking at medium-high heat until it starts to look translucent. Add the chilies and cook a minute or two more. Add the tomato or red pepper, salt, and cumin. Stir-fry a minute or two more. Add the tofu and mix it gently so as not to break up the tofu too much. Use a flat spatula and a folding and turning mixture, cooking for 3 minutes or so. Place on a heated platter to serve, or on individual plates. Stir in the the chopped herbs, or sprinkle them on the top. Sprinkle the black salt evenly over the dish just before serving. Serve with hot whole wheat chapathi, paratha, or tortillas. We ran out of bread the other day. Strange, because Brian bakes bread for special customers, and I bake, too. But it was all sold. 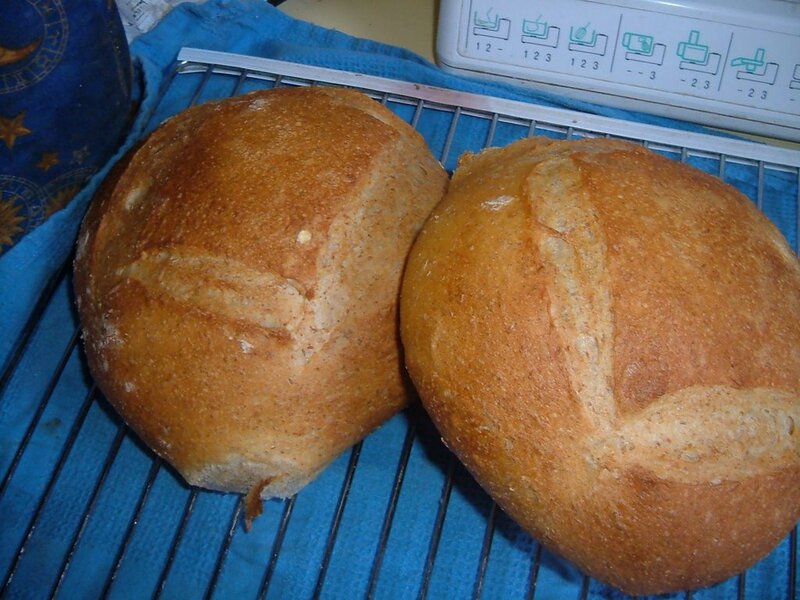 So, at Brian's request, I made my crusty bread. I don't call this bread "artisinal", but it's very crusty, and tasty. This particular recipe does not need a starter, but you make a "sponge", a sort of quick starter to get things going. Since you can rise this sponge in an hour, you can make the bread without planning ahead. Or you have the option of rising the sponge overnight. 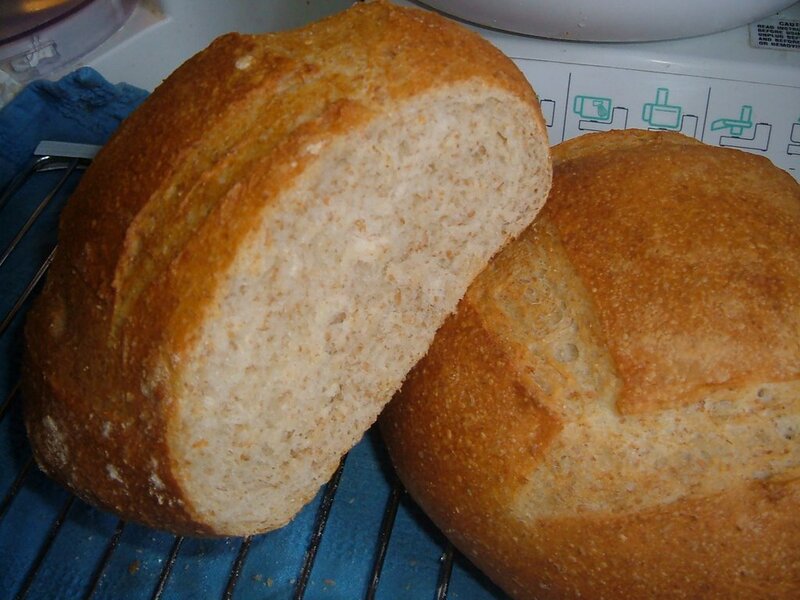 This type of bread is actually a very simple one and easy to make. Just remember not to try and speed it up by using more yeast or skipping a rising-- it needs time to develop flavor and texture. 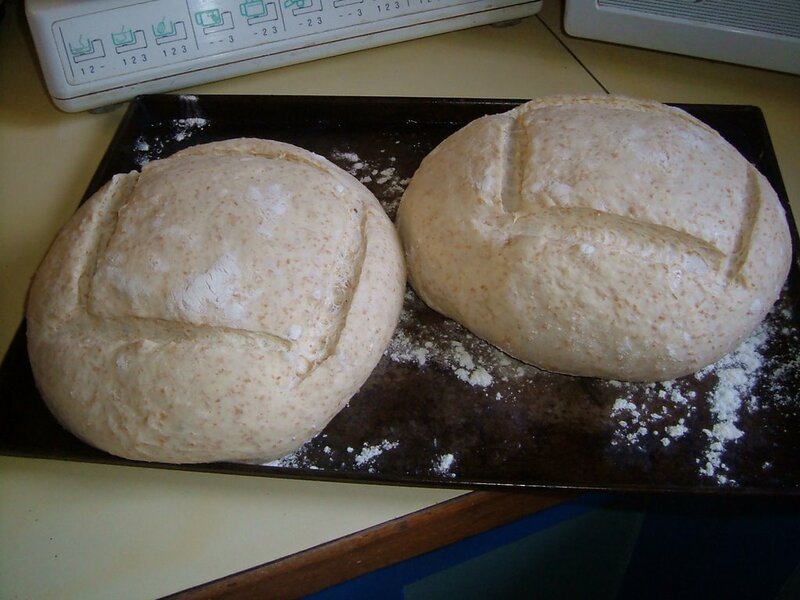 It also needs a hot oven and some moisture at the beginning of the baking, to develop "oven spring" (the last burst of rising) and to form a golden crust. 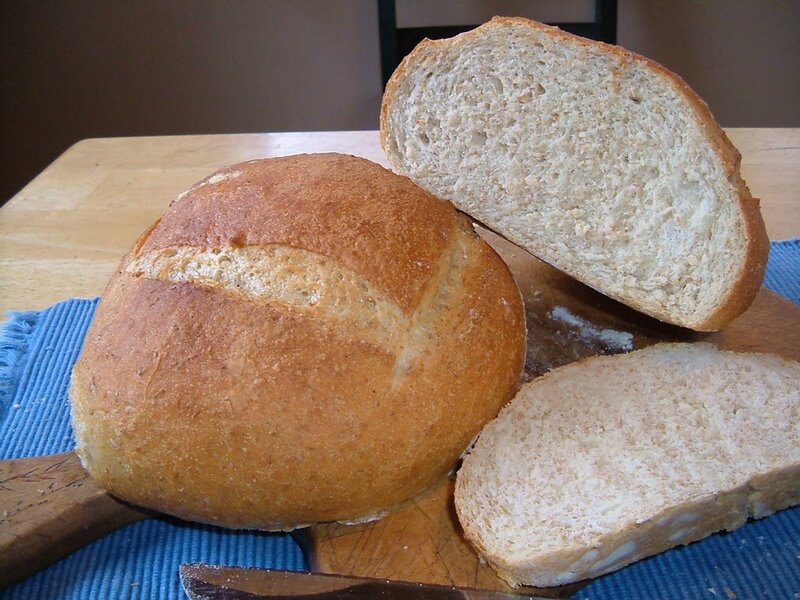 You will notice that this bread, like most European breads, contains no sweetener or oil. 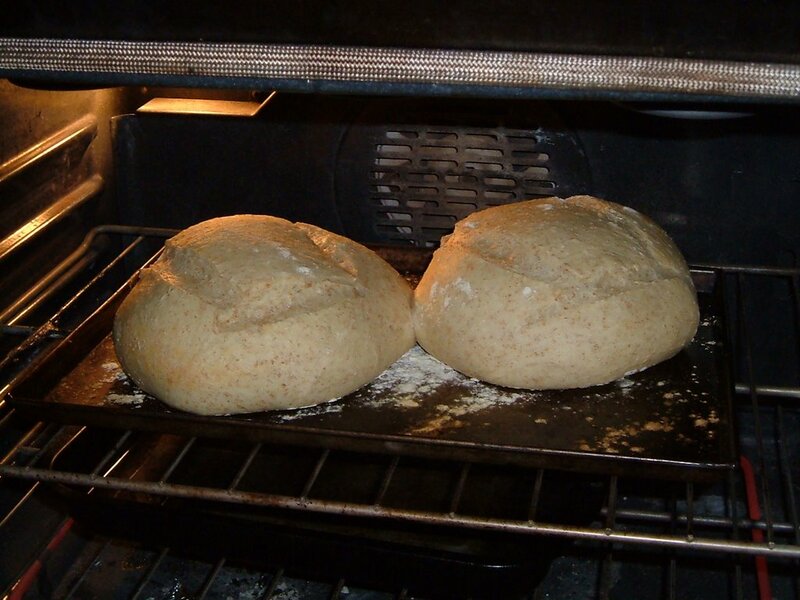 The yeast can feed off the natural sugars in the flour, so needs no sugar. The lack of oil gives the bread a crisp crust and chewy texture, as you expect with this type of bread, but makes it stale fast. So, if you aren't going to eat it within a day, freeze it. The first baking, I used all unbleached flour with the bran, I rose the sponge in a warm kitchen for 1 1/2 hours, and I used my Bosch Universal Mixer with a dough hook to mix the dough. I didn't bother with a baking stone this time (I did use both the pan of water in the bottom of the oven, and sprayed the loaves with water 3 times at the beginning), but the crust was super crunchy! I confess that I ate one crusty end and another slice for lunch, warm from the oven! The second baking, this afternoon, I used 2 cups of wholewheat flour and 4 cups of unbleached flour, and mixed, kneaded and rose the bread in my Oster bread machine. It came out very well, too. See the photos at the bottom of this post. In a large bowl or bowl of a heavy-duter mixer dissolve the yeast in the water for about 5 minutes. Stir in the first 3 c. of flour and the salt. Beat well, cover with plastic wrap and let this "sponge" (batter) rise for 1 or 2 hours in a warm spot OR overnight in the refrigerator. Stir in the last 3 c. flour a little at a time, adding only as much as necessary to make a kneadable dough. Knead the dough with the dough hook of a heavy-duty mixer or by hand on a lightly-floured surface for about 10-15 minutes. 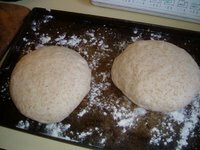 Add a little more flour as needed, but be careful not to make the dough too dry-- it should be moist but not sticky, and very pliable. Slam the dough down hard on the surface a few times after kneading (to get rid of air bubbles). Place the dough in a large lightly-oiled bowl, cover well and let rise at room temperature until doubled. Punch down. Punch the dough down and divide it in half. Shape the dough into 2 long loaves, or rounds or braided loaves, or into 12-16 loaf-shaped rolls. Place on a non-stick or lightly-oiled cookie sheet sprinkled with cornmeal or semolina cereal (cream of wheat). (If you are baking on stones or tiles , place the loaves on greased and well-floured flat cookie sheets with no lip or rim, or on pieces of stiff cardboard covered with greased and well-floured baking parchment .) Sprinkle the tops with flour, cover with slightly damp clean tea towels or place inside of large plastic bags, and let rise at room temperature until doubled. Meanwhile, preheat the oven to 450 degrees F (convection 425 degrees F). 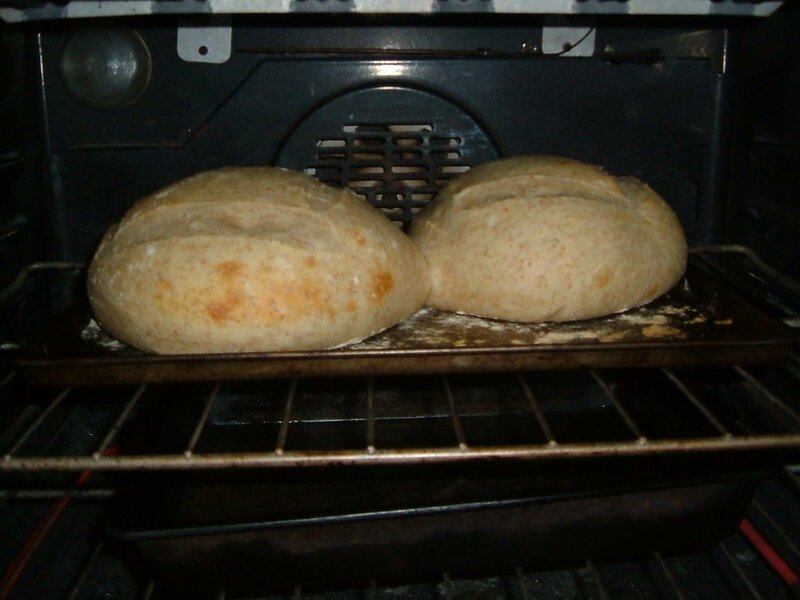 In order to generate steam in the oven, you can place a shallow pan of hot water in the bottom of the oven, AND/OR squirt the loaves and the walls of the oven two or three times in the first 10-15 minutes of baking with cold water in a plant mister. Bake 15-20 minutes more, or until the bread is a rich golden brown. (Rolls will take less time and a convection oven will also probably take less time.) 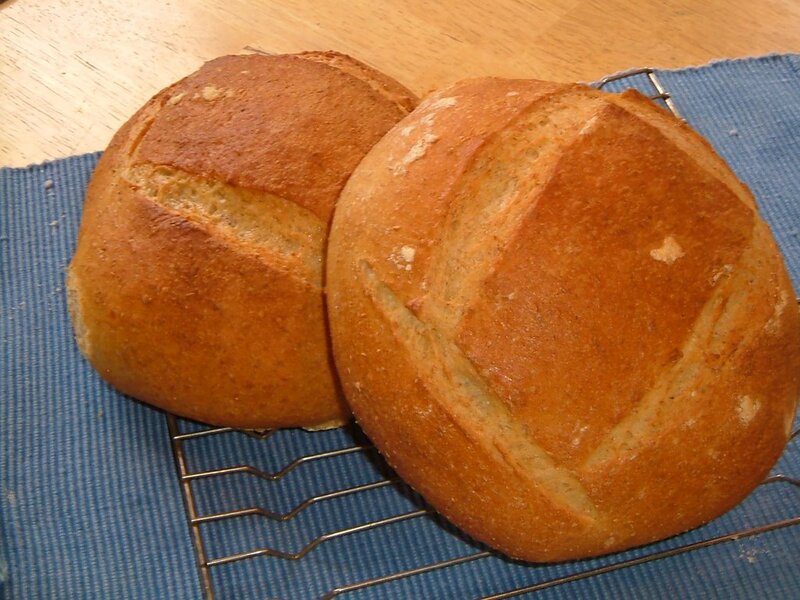 Remove bread from pans and cool on racks. When the bread has cooled, you can freeze it wrapped in foil, then reheat it wrapped in the foil at 350 degrees F for 20 minutes. Making sticky bread doughs in a modern bread machine is a wonderful time-saver, and certainly very clean (no messy hands or counter). 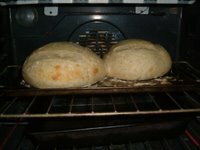 But you must bake the bread in a regular or convection oven, or you will be disappointed, even if you have a "crusty bread" or "French bread" selection on your machine. If your bread machine makes large (2 lb.) loaves, it can probably handle kneading the whole recipe. If it's an old one with a smaller capacity, you may have to knead half a recipe at a time. Make the sponge first. You can let it rise right in the bread machine pan. When it has risen, add the remaining flour. Select the dough cycle and let it go to work. You can remove it from the machine after it has kneaded and rise it in a bowl, or, if the your container is big enough for the dough to double, let it rise through the entire dough cycle, then remove for the final rising and proceed with the recipe as instructed above. FOOD PROCESSOR DOUGH: You can make this dough in a large food processor, or in two batches in a medium food processor, following the directions given with your machine. Mix and rise the sponge in a bowl first. Process the final dough ("knead") for 60 seconds. This what we had for dinner last night. It's a very simplified, lower-fat, vegan version of fesenjan, a famous, rich, and elegant Persian poultry or game dish, which usually contains lots of walnuts and more spices. I hadn’t made this recipe in a long, long time, but came across my review of the book it came from and thought it was worth repeating, since I didn't have much time to cook and had all the ingredients. I had my notes of the changes I made from the first time I made it, so followed those. I almost doubled the pomegranate molasses! It's very good in a subtle kind of way, and pretty quick to make. It wasn't Brian's favorite, though. I think I will try to work out my own version of fesenjan someday. 1. Saute onion in hot oil in large skillet until richly browned, but not burned, 8 to 12 minutes, stirring often. (If necessary sprinkle a little water to keep the onions from burning.) Stir in garlic and gingerroot. Add turmeric, cumin and the 1/4 cup water. Cover and cook 3 to 5 minutes. Remove from heat. 2. Process onion-garlic mixture, walnuts, and the 1/2 cup water in a food processor until thick and creamy, adding a little extra water if mixture is too thick. Remove to a medium bowl (rinse the blender with the extra 1/4 cup water and add that to the mixture-- BCG) and add sugar, pomegranate syrup, salt, and red pepper. Mix well and transfer to the same skillet. 3. Bring mixture to a simmer. Add tofu (and roasted red pepper, if using-- BCG) and peas. Simmer, covered, 5 to 7 minutes. During this time, uncover once and gently turn the tofu pieces. Taste and adjust the salt and cayenne. Serve garnished with cilantro. Best served with plain steamed basmati rice—- it was also good in a tortilla or Arabic flatbread wrap! UPDATE OCTOBER 27, 2010: Solution to the "casein in coconut powder" problem (see below in Aug. Update)! Coconut FLOUR! It is made from dried coconut meat with most of the fat removed. NO CASEIN! It's high in fiber, too, BTW. There are many, many brands out there now. I'm using an organic Canadian brand, Alpha, which is reasonably priced and the label states that 2 tablespoons contains 26 calories, 1.2 g fat and 5.4 grams of dietary fiber. The calories vary from brand to brand, but the fat content seems to be about the same ( not sure how that works!). Here are some organic brands available in the USA: Swanson Organic ; Let's Do Organic ; Aloha Nu ; Tropical Traditions ; Island Harvest ; Bob's Red Mill ; Wilderness Family Naturals . It's a tiny bit grainy, but it has alot of coconut flavor, and it smooths out nicely when well-blended in a Vita Mix or blender. So, give it a try in my updated low-fat coconut milk recipe below. I know that So Delicious has a new low-fat coconut milk beverage tastes good, but it doesn't have the intense coconut-y flavor that coconut powder can provide for cooking and baking (without all the fat), unfortunately. So I guess I'll have to go back to the drawing board. (BTW, in case you're wondering why I haven't climbed on the coconut oil bandwagon, read this.) Also, I'm not opposed to using or drinking coconut milk beverage [or rice or almond, etc. ], but be aware that the nutrition simply does not equal that of soy milk, or, second in line, hemp milk! See this article comparing non-dairy milks. Anyway, I'll report back when I do some more research. Spice Island Vegan and I have been having an online conversation on low-fat coconut milk. She’s been craving South Asian dishes, but she’s also been cooking low-fat to lose weight. I seldom use coconut milk because of the fat and the fact that there is so much saturated fat in it. Regular Taste of Thai coconut milk contains 420 calories and 45 g fat per cup! Taste of Thai Lite coconut milk contains 135 calories per cup and 12 g fat, better, but still too high for me and Spice Island Vegan. 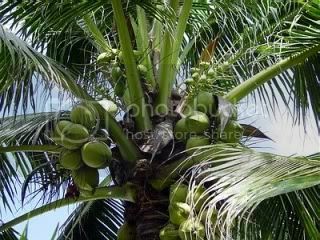 Unfortunately, we have found no really good coconut flavoring, whether extract or oil, natural or not. Some are downright nasty! This recipe is easily multiplied (or halved). It makes a really creamy, slightly-thick coconut milk. Almond Breeze is my preferred liquid for this recipe (or Silk Almond). It is made from almonds, but is quite low in fat, and has a nutty flavor which is closer to coconut flavor than either soy or rice milk. You can also use the new low-fat So Delicious Coconut Milk Beverage, if you prefer. This milk can be used in East Indian, West Indian, Southeast Asian, and other dishes which call for coconut milk. The real thing contains from 45 to 60 g of fat and 400 calories or more per cup, compared to 4.4 to 5.4 g fat and 104 to 120 calories per cup for this recipe! It is also alot cheaper AND creamier than canned regular or lite coconut milk. 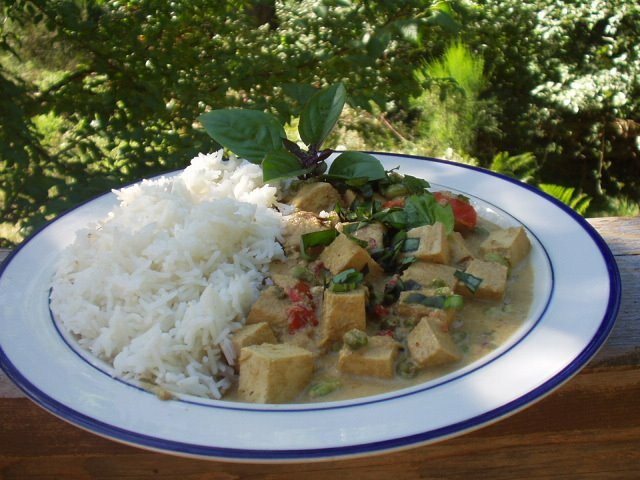 NOTE: If you pressure cook a dish with the mock coconut milk, add the blended silken tofu just before serving. NOTE: For a soy-free mixture with a few more calories. substitute 1/4 cup raw cashews and 1/4 cup more milk for the tofu. Mix in a blender until very smooth. Refrigerate in a sealed jar. For "Coconut Cream" or Thick Coconut "Milk", use more silken tofu (or raw cashews), and less milk. For a thinner "coconut milk", omit the tofu and use 1 cup milk. NUTRITIONAL ANALYSIS calculated using Almond Breeze Original, regular extra-firm silken tofu and Alpha Organic Coconut Flour. Nutrition (per 1/4 cup): 26.6 calories; 32% calories from fat; 1.1g total fat; 0.0mg cholesterol; 42.9mg sodium; 62.2mg potassium; 3.8g carbohydrates; 1.3g fiber; 1.8g sugar; 2.5g net carbs; 2.0g protein; 0.4 points. Nutrition (per 1/4 cup): 30.6 calories; 43% calories from fat; 1.6g total fat; 0.0mg cholesterol; 15.9mg sodium; 44.2mg potassium; 3.6g carbohydrates; 1.1g fiber; 1.6g sugar; 2.5g net carbs; 2.0g protein; 0.5 points.